Barb Conant is a counselor at Juneau Douglas High School. She attended the Spring 2014 Talk Story, Write Story workshop in Juneau. This past fall the first of my eight siblings died. As adults, and even as children, Tom and I were not close. He was in the top tier of the hierarchy of sibling order and I was in the bottom tier. I knew him as the brother who said what he felt, at times being oppositional just because it was an interesting thing to do. He left our family and my life in the summer of his high school graduation with little fanfare. With a used backpack stuffed with a Coleman sleeping bag and 300 dollars in his pocket, he walked down the path that trailed through our property. I had little interaction with him since that departure. So it was a surprise to me when I received a phone call from him last August to tell me he had a diagnosis of cancer. Tom was given three months to live. He asked me two questions, 1) should he tell the rest of his siblings and, 2) if yes, how should he proceed in informing the rest of the family? I provided that yes, he should tell the rest of the family and, the sooner, the better. I told him I would e-mail the contact phone numbers so he could call them. After the call, when I was able to process the conversation, I realized he was asking me to share the information with the family. By using his imminent death as a catalyst, he wanted me to help him bring our family together. I was the one he chose to reconnect my scattered brothers and sisters. We, my siblings and I, needed to be reaching out to him and not the other way around! Thus began the momentum of coming together to help support Tom as he faced his own death. Each phone call to a brother or a sister from then on put me in the position of what my mother would have done; the coordinator and sharer of information and guide for each stage of the illness. Through daily phone calls and frequent visits to Santa Cruz, Tom became my mentor and advisor on bringing our family together. He also mentored me on how to face your own mortality with grace, frank conversations, humor and courage. Taking the role of family leader was hard both logistically and emotionally. I am a person who lives her work. I work as a counselor in a high school. My students are my responsibility and I take this to heart. Time away from school during one of the busiest times of the year was a major stressor. As a counselor, I would advise others in my predicament that family comes first, but this was not an easy choice for me. My students and colleagues are also my family. My emotional energy was divided. I did not know if I had the reserves to do it all. Tom helped me through this. He embraced me with unconditional love and allowed me to ask questions and talk about anything. I looked forward to our daily talks at appointed times, my reading out loud of Lee Child to him over the phone when he tired of the life and death conversations. I learned how to integrate this personal journey with both my biological and school family. They did not have to be separate from each other. I took a risk and shared my brother’s story with my students. 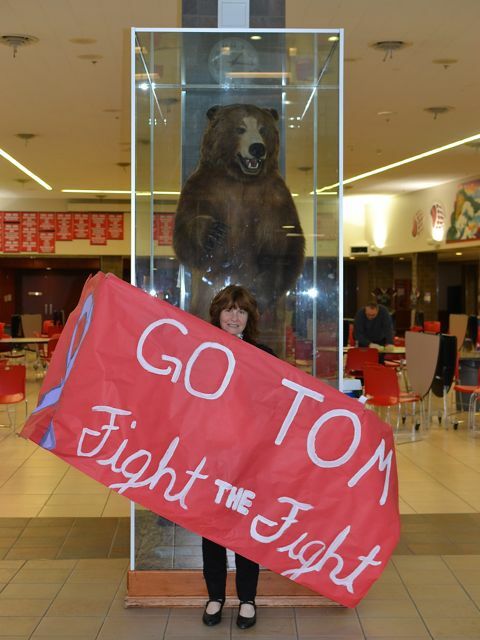 They rallied with posters and positive messages to Tom. Physically, our family came together, not once but twice to celebrate Tom’s life and us. Tom was a full participant in the first celebration. However, he ended up being rushed to the hospital 40 miles away, due to internal bleeding. At my insistence, we moved the reunion to his bedside. It was quite evident while there that Tom needed support with his medical issues as well as with helping his wife and children understand the process of dying and honoring his wishes. At dinner that night, I made the announcement that I was going to stay longer. When I made this statement I directed it to my sister. Therese is the scientist in the family; analytical, pragmatic and strong. I was hoping she would volunteer to stay with me. She could be the daily driver to the hospital (I am afraid of driving in California) and the medical interpreter. She was also the sibling that Tom was the most estranged from. Tom made it clear to me earlier in the day that he wanted to have a relationship, at a minimum, of mutual regard but ideally, one of love with Therese. During the rest of the week, I sat in the back of the car, watching and listening to Tom and Therese catching up on their past as we drove back and forth to the Veteran’s Hospital in Palo Alto. With brutal honesty they shared their disappointments and accomplishments. They came to the conclusion they got along like “oil and water” while growing up and forgave themselves for not being part of each other’s adult lives. At times, I was jealous that I was not a part of these discussions but knew this scenario was unfolding as it should. Before he died, Tom was able to connect with all of us – owning his part of omitting us from his life, forgiving himself for it, and forgiving us for the same omission. I like to believe that I took a leadership role in helping Tom and our family navigate through his last days. In return, Tom taught me how to die. He showed me that at any point in life you can change your course, live each day true to what you believe in, and fix the relationships that are important to you. It was a transformative experience. “Once you decide to be a saint, it simplifies everything. Just be a saint,” Tom said with a twinkle in his eye. He died two days later. My brothers and sisters reunited a second time for Tom’s memorial service. We spent three days together in a place that overlooks the Santa Cruz Harbor. We spoke of our parents, our brother, and made promises to not wait for another death to bring us together again. These may turn out to be empty promises but in the meantime, the fabric of our connectedness has been strengthened and our beginnings remembered. We have become a family again. My father, John Kennedy Conant, sat night after night in his “work” chair grading papers and working on lesson plans for his Spanish and Chemistry classes at Franklin Pierce High School. He explained that just as his students had their homework, he had his to do. The brief case with the crumpled lunch bag inside, brown vinyl grade book, red ink pen, the intense concentration on his face with occasional heavy sighs as he marked the grades were the comfortable and safe routines that I witnessed growing up. I do not know if I perceived joy as he worked but I did see dedication to his routine. I never connected in my mind what he did every day to my own experience at school. My father loved the concept of education, the process of learning and the subjects he taught but I am not sure if he was comfortable or confident in his abilities as a teacher. For me, being a teacher’s kid meant being probed at the dinner table on what I learned at school that day. His face became animated when he could get us to discuss a subject, an idea and how it related to our lives. It also meant having extended vacations – it was not until after I moved away from home that I realized that not every family had summers to explore the country in a station wagon. It was his wish that I follow in his footsteps and teach. I had eight brothers and sisters, but it was me who he expected to become the teacher that he did not think he could be. Initially, that is what I thought I wanted also. It is what everyone supposed I would do. However, in my final year at college, I froze. My father’s legacy of uncertainty and lack of confidence found me a willing recipient. At five feet one inch, towering seniors physically intimated me. After a mediocre student teaching experience, I moved on to other occupations. Varied work experiences over the years helped me grow in understanding what I did not want; predictability, tedium, little opportunity for social interaction with young adults and no cyclical rhythm to the work year. With gained confidence and maturity, I went back to school to get my Masters of Education in Counseling and Guidance so I could be in an environment where I am stimulated every day. I am not a classroom teacher but I am instructing and guiding students, parents and, at times, colleagues. There are days that I know I am way over my limits in abilities, stamina, and endurance. Working with young adults as a counselor can be the most gratifying experience and at the same time the most frustrating. It definitely can be the most heartbreaking. Since I have worked at Juneau-Douglas High School, I have become part of a community that has endured suicide, murder, accidental and unexplained death. I have become a grief expert. I have listened to stories of abuse, dysfunction, and lost hope. There are days when I question what purpose I have because it seems so overwhelming and so little I can do to help and mornings that I feel I cannot get out of bed because my body is too heavy to lift. But this is not everyday. Most of my days are full of humor, awe of students, and satisfaction in even the smallest of achievements. I feel accomplishment and pride when I see a student first realize that they can achieve and take ownership of their education, when they experience success at work, in a play, or activity. Most of all I love the frenetic environment, the fluidity of the day, the unexpected challenges, and of course the cyclical nature of the school year, something that I grew up with. I do not spend evenings correcting papers but there are many hours spent in my “chair” writing letters, reviewing grades, and making phone calls home. My father died before I received my Masters. Although I am not teaching, I think he would be proud of my work in education.